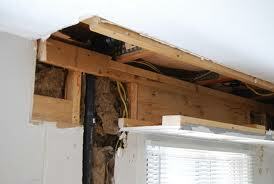 Kitchen soffit take-down takes more than meets the eye. A kitchen soffit is a built-in fixture, situated between the top of the cabinets and the bottom of the ceiling. Most often, this rectangular structure is in-place to conceal electrical wiring, pipes, or other types of mechanical systems. In a few instances, it’s hollow and empty, simply serving to bridge the gap below the ceiling and the top of the cabinets because the cabinets are not tall enough to reach the ceiling. Clear out the kitchen and cover everything. The kitchen should be empty and covered in plastic and/or drop cloths. This includes anything on the countertops, and even the microwave, if it’s not mounted.